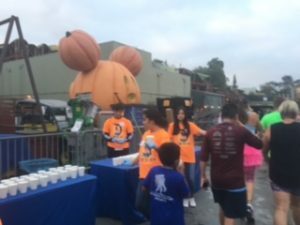 The Dumbo Double Dare Challenge is a 2-race challenge that takes place at runDisney’s Disneyland Half Marathon Weekend in Anaheim. 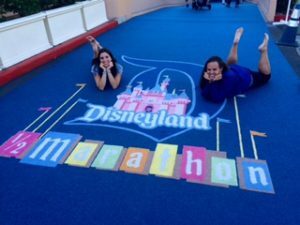 We will have full coverage of both events that make up this Challenge: The Dynamic Duos 10K and the Disneyland Half Marathon. I decided to run the Dumbo Double Dare Challenge for multiple reasons. 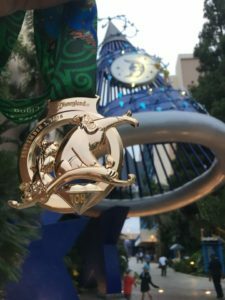 I really wanted to get my Coast to Coast medal again this year (the previous year I received the pink Coast to Coast medal for running the 2015 Glass Slipper Challenge and the 2015 Pixie Dust Challenge. To be eligible for this medal one just needs to run at least a half marathon at Walt Disney World and another at Disneyland. 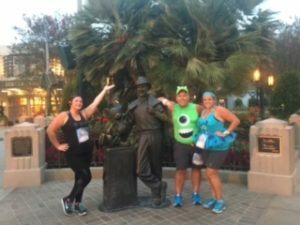 By running the 2016 Goofy Challenge and 2016 Star Wars Dark Side Challenge I had the Walt Disney World part of the challenge taken care of; now I just had to choose which California race to run. 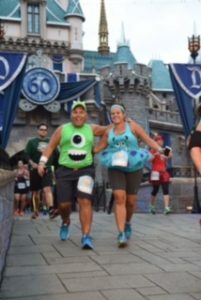 Being that I already ran the Tinkerbell Half Marathon (and Mike had zero interest in running Tinkerbell since it is on Mother’s Day Weekend) I had three races left to choose from: Star Wars Light Side Weekend, Disneyland Half Marathon Weekend, and Super Heroes Weekend. Unfortunately Star Wars Light Side had already sold out before I decided I was going to try for my Coast to Coast this year, or else that would have been my number one choice (have you seen the Kessel Run Challenge medal?!?!). From there the choice was easy I knew hands down I would run Dumbo over Super Heroes. We flew into Orange County airport on the Thursday before the race so we would have time to get adjusted to the time change (3 hour time difference from Ohio) and the area. Flying in Thursday gave us plenty of time to enjoy Trader Sams and attend the race expo plus a full day in the parks on Friday (yes we stayed for the 60th Anniversary Fireworks and Paint the Night Parade the night before the 10K). There was nothing that I HAD to have at the expo, so we took our time getting to the expo and decided we did not have to be the first people waiting in line (plus our flight hadn’t landed yet). 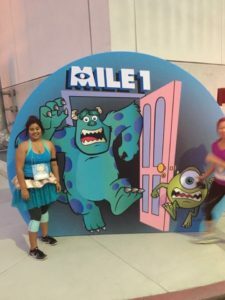 Check out our tips for surviving a runDisney race expo. When we got to the expo we decided that first on our list was to stop at the official expo merchandise, where I picked up my essential sweaty band (so other runDisney runners can find me at local races) and a running tank top. Next we headed to pick up our bibs where we had to stop for a quick photo to make us eligible for the Dumbo Double Dare challenge and our bonus SMOs. We then headed into the official expo where we picked up our race shirts (for the 10K – a short sleeve hunter green tech shirt with Aladdin, Abu, and Genie on it; for the Half – a short sleeve royal blue tech shirt with Mickey and Pluto on it; and for the Challenge – a short sleeve grey tech shirt with Dumbo and Timothy Mouse on it). We then explored the expo a little bit where we sampled different energy foods and made sure we checked into the New Balance booth for our NB Rewards App. 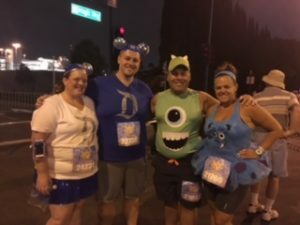 We brought back our Mike and Sully costumes from the 2015 runDisney Wine and Dine Half Marathon, with a few modifications. For my Sully outfit, I went with a blue washout tank with Sully’s face on it, grey Reebok compression shorts, blue tutu with purple spots, Swiftwick running socks, blue headband, and Brooks Adrenaline 16 GTS running shoes. I will give it to Disneyland, their pre-race experience is much more enjoyable than Walt Disney World’s. Mike and I were able to leave our hotel at 4:30AM for a 5:30AM race start. In Florida we would have been leaving our hotel by 3:30AM at the absolute latest. Leaving at 4:30AM gave us time for a bathroom stop along our walk and time to chat with our friends Jason and Laura before loading into the corrals. We never actually went into the pre-race party area because the way we walked from our hotel it made more sense to go directly to our corral. I will say that there was some confusion as how to get to the corrals from our hotel because it was not the same path that we had been using to take to the theme parks the day before. 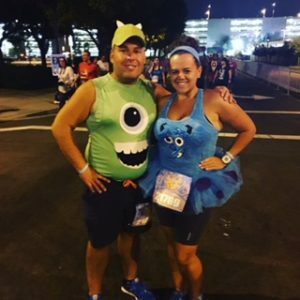 I feel that if we would have had the printed race guides (runDisney made the decision to go to electronic race guides this race weekend) I would have spent the time looking thru it the day before and would have known that we had to go thru the Mickey and Friends parking garage to get to the start line. At about 5:15AM (the corrals did not close like they do at Walt Disney World) Mike and I loaded into our corral and met up with our friends: Dave, Amber, and Mack. I will say it is much more enjoyable to have friends in your corral to chat with until it is time for you to start running. Nothing is worse than having to get into a runDisney corral 30 minutes before the official start time then having to wait for your corral to actually start. The start line began on Disneyland Drive between Disneyland and California Adventure. The start of the race headed south down Disneyland Drive for almost a mile. During the first mile the five of us decided to start out running together, but before the turn our group of five dwindled down to Mike, Amber, and myself. We turned left onto Orangewood Avenue and the mile 1 marker was right there; sadly I missed it. 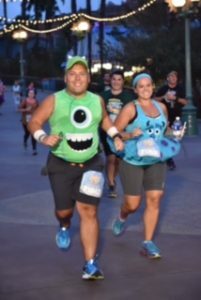 Had I saw it I would have definitely suggested we stopped because it was a Monster’s Inc sign and Mike and I were dressed as the Dynamic Duo, Mike and Sully! Photo Credit: Jason Cartwright for catching this dynamic duo! The next mile was spent navigating around the Anaheim Convention Center by heading northeast to put us onto Harbour Blvd to head north toward California Adventure. I do not remember much of this mile because I was so busy conversing with Amber and Mike, and I was also the one calling the intervals so my eyes were glued to my running watch, but Mike tells me that he really enjoys this section of course, especially the way the Convention Center and palm trees are lit in the pre-dawn light. Next it was time to take a sharp left onto Disney Way and make our way into the backlot area of California Adventure. This was the part we had been waiting for and the mile two marker was just ahead! I decided beforehand to try out a handheld carrier for my phone so it would be easier to take pictures, unfortunately there was no way to take pictures thru the case so I had to take the phone out. I handed Mike my case to put in his pocket and never touched it again until after the race. Right before entering California Adventure we had our first water stop. I had looked at the course map in advance and realized there were only two water stops on this course (much to my disappointment) and made the decision to carry my own water. However, I was looking forward to this stop because I was ready for some Powerade (which is a staple at runDisney races) and to I was let down, no Powerade :(. Time to put a smile back on my face though because it was time to enter Cars Land at California Adventure. 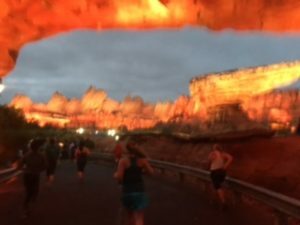 Let me just say I am highly impressed with Cars Land (as in I think it is the best land any Disney park has) so running towards Radiator Springs Racers in the dark is absolutely gorgeous! We then turned right and headed past Luigi’s Rollickin Roadsters (side note – this ride is highly underrated, and I suggest taking these little cars out for a dance) towards A Bug’s Land. Along this way there was a stop for a DJ a character from Cars, however we noticed that there was not an official Photopass Photographer at this stop, so we decided to skip it. In A Bug’s Land there was a stop for Flik and Atta, but once again no Photopass Photographer. 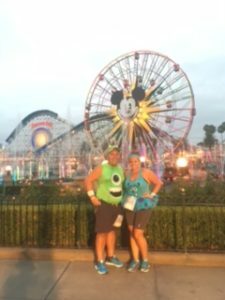 It was time to head to Paradise Pier, but right before heading onto the pier we made a quick pit stop to take a picture with Mr. Incredible. Unfortunately once again no Photopass Photographer so we had to take the picture ourselves, are you beginning to notice that we were highly disappointed in the lack of Photopass Photographers? Now it was time to make the trek around Paradise Pier, which was absolutely stunning in the dark with the World of Color fountains going. Around the Pier there was a character stop for Buzz Lightyear at Toy Story Midway Mania right after passing the mile three marker and Max and Goofy at Goofy’s Flight School. Next we headed towards Grizzly River Run past Soarin’ onto Carthay Circle. At this point we decided we needed an obligatory photo in front of the Storyteller’s Statue. After that we headed toward the Tower of Terror (a Judy Hopps photo stop was along the path) then headed backstage of California Adventure to make our way toward Disneyland and past the mile four marker. I recall that this next mile was very boring and felt like we should already be to Disneyland. 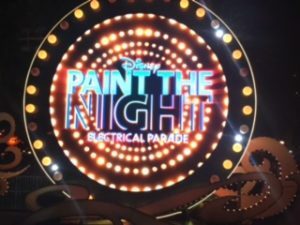 I do recall that there was a backstage area that we ran past that had extra carts for rides such as Splash Mountain, Space Mountain, and Matterhorn sitting out that I found interesting because the carts are different than the rides that are at Walt Disney World. Right before entering Disneyland we ran past our second (also last) water stop. What was most interesting about this water stop was that some of the Halloween decor for the parks was back there which was exciting to see. We entered Disneyland via Toontown where Daisy greeted us by waving to us from Donald Duck’s Boat. Next we made our way past A Small World towards Matterhorn Mountain and entered Tomorrowland where Storm Troopers were greeting us at Star Tours. We then looped back toward Fantasyland past Alice and Wonderland and the Mad Tea Party and made a left at the Storybook Canal Boats where a quick photo op was available with Geppetto. We then made our way through Fantasyland and turned left after the carousel and it was time to run thru Sleeping Beauty’s Castle. No matter what runDisney race I am running I always finding running thru the castles to be a magical experience. Next we ran around the hub (where Pooh and Piglet were rooting us on) and strolled right down the middle of Main Street USA (yes I know I just got the song stuck in your head, you’re welcome). Minnie Mouse waved us goodbye as we exited Disneyland onto the esplanade and headed right toward Downtown Disney, which was full of crowd support. We were now on the final stretch of the race with less than a half a mile to the finish line. 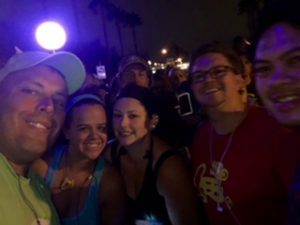 We finished strong and ran thru Downtown Disney where Tim was cheering us on and headed straight to the finish line. If there is one thing runDisney knows how to do it is to make the most coveted SMOs in all of running. The 10K medal was of Aladdin, Genie, and Abu riding the Magic Carpet in gold with 10K written on a diamond. Aladdin is in my Top 5 favorite Disney movies so this was definitely a SMO that was a must for my collection. Photo Credit to Tim O’Connor for this great shot. The post race ended in the Lilo and Stitch parking lots. 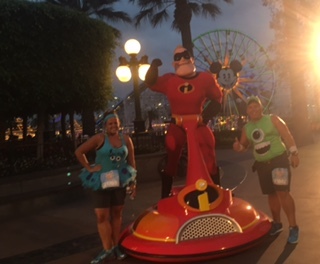 It was the typical RunDisney race ending. Pick up your medal, then water, then Powerade, challenge medal confirmation, finish photo with medals, RunDisney snack pack, and get your banana. I did not check a bag, but if I had I would pick that up next before leaving the runners only area. We enjoyed a few snacks with some friends before embarking on our half a mile walk back to the hotel (it felt much longer after a 10K). I had made the decision to make my music a Disney song then a non-Disney song, a Disney song then a non-Disney song, and so on. I really enjoyed my playlist. However, running with Mike and Amber I really wasn’t paying attention to my music. Also I had decided to use my phone to take pictures during a race for once and every time you turn the camera mode on an iphone the music shuts off. I would absolutely run this race again! By far it is the most in park time any runDisney race offers. Unfortunately California is quite a haul just to head out there to run a 10K.